As always, to start off our letter of the week, we stopped at the library and picked up some books: giraffes, grasshoppers and growing. We didn't actually do any grasshopper projects or activities, but Spencer requested we learn about them. Since Fall has been creeping in, I've decided to embrace it instead of fight against it. I bought a pumpkin and incorporated into our letter G. Dave gutted the thing one day while the boys took their final backyard dip in the kiddie pool. Hello, Fall; meet Summer. 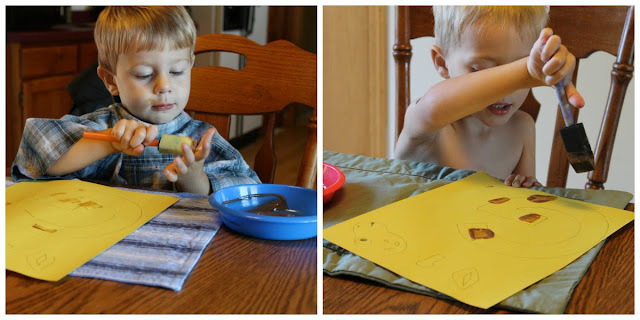 Spencer insisted on painting the pumpkin because apparently that's what you do with them. 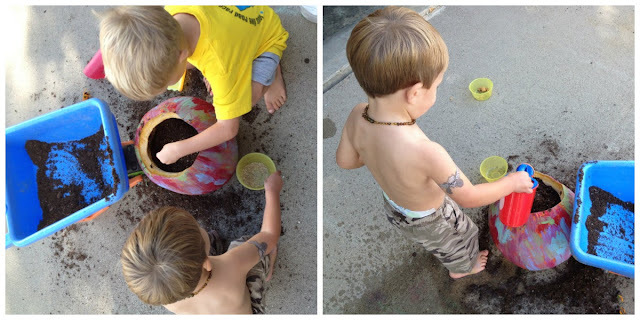 Then the boys filled it with dirt, threw in some grass seed and watered it. Now we will wait to watch our own little patch of grass grow in our pumpkin. Since Spencer is at preschool three mornings a week now, I have more time to devote to Ashton. 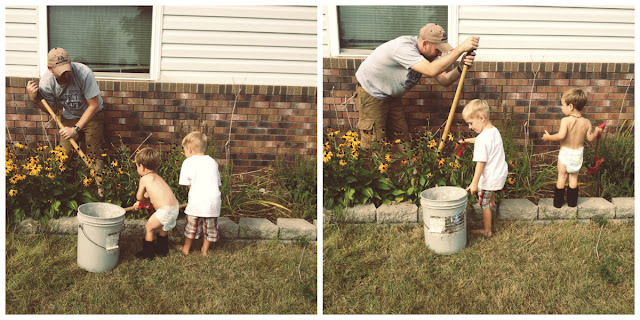 It is a bit challenging doing projects with the boys since Spencer is far above Ashton's skill level. I'm looking forward to using the time Spencer's away at school to focus on Ashton's specific skills. 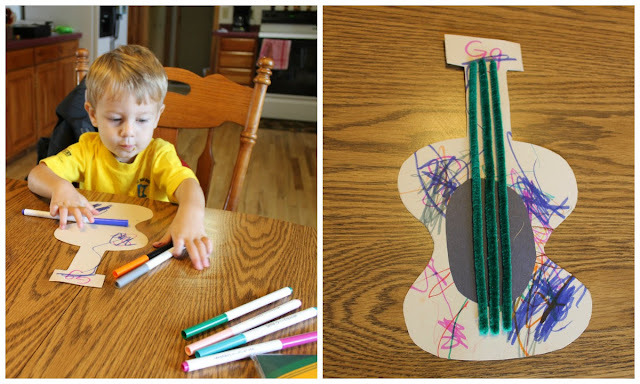 This week we made a guitar. I thought afterwards we could have a little jam session, but Ashton wasn't nearly as excited about the idea. I've hesitantly given up the fight to hang onto summer. We've checked off all the items on our summer bucket list, and then some, so I'm finally ready to concede to the changing season. I love fall, almost as much as summer. I love how summer reluctantly gives way to fall, her spirit warming the afternoons and allowing us longer stretches of the beloved season. I love how fall sneakily creeps up, cooling the mornings and nights, painting a leaf red here and an orange one there, slowly, sporadically, until all the green has turned to vivid amber and orange. Here are a few signs of fall in our lives. 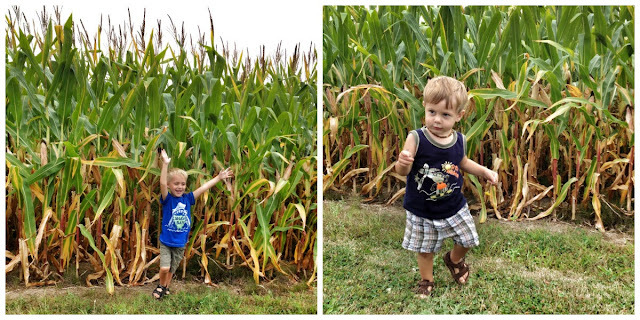 Spencer wanted to measure how big the corn was in comparison to himself. Our morning trek to drop Spencer off at preschool. We had to bundle up on the way there, and peel off layers on the way home.